"How cruel. First we get dead chickens, then storks trapped in the toilet, then sharks in tea, then cats being forced to fight, then ravens being force fed chips, then bullied pups, then drowning monkeys and now this. Where will it all end?" Very nice, but can she serve tea? I saved 15% on my car insurance by switching to Geisha. She likes a walk in the woods but prefers the far east. Now that takes the bisuketto. 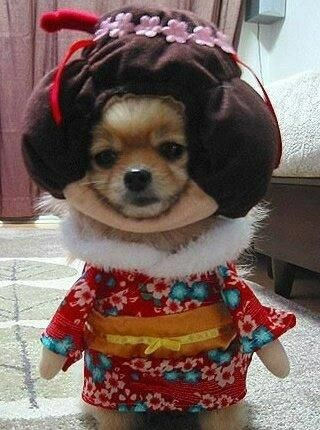 Dressed up like a dog's dinner in China. "And now I suppose I'm going in the handbag?" "Please let's give the flour a miss this time. It makes me sneeze!" This place has the ugliest hookers. How to look like a dickhead. "Anyone seen my willy warmer?" It was going so well until we tried the foot binding. I'm sure the bite marks on our fingers will soon heal, though. "There you are madam, as promised, one Transylvanian hound." "I'd prefer an outfit which hides my double chin."